Catholic News World : Wow Pope Francis makes Surprise visit to Home for Mothers in Difficulty and Greets the Children! Wow Pope Francis makes Surprise visit to Home for Mothers in Difficulty and Greets the Children! 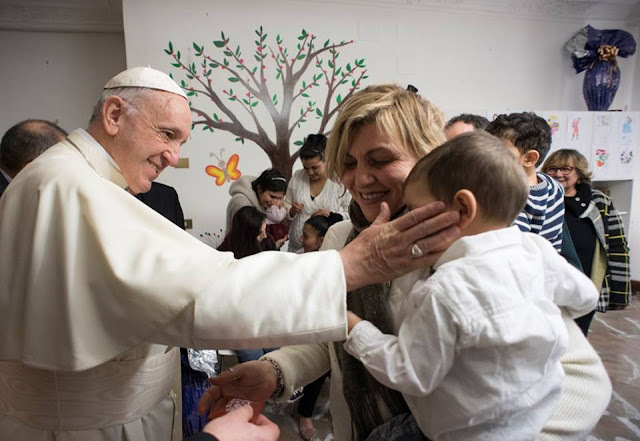 Mercy Friday: Pope visits women in semi-detention with young children Today Pope Francis continues his Mercy Friday tradition, surprising mothers, their children, and the staff of “Casa di Leda” in Rome’s EUR district. At 4:00 in the afternoon the Pope surprised the 5 mothers (between the ages of 25 and 30) and their children, and staff as they were going about their normal afternoon activities. Pope Francis exchanged a word with the mothers and staff on duty, and he played with the children. The children welcomed his gift of large Easter eggs with shouts of joy. They then invited him to have a snack with them. The mothers in their turn gave the Pope a gift which is the product of the many simple activities and tasks that they carry out inside the shelter. They also had the chance of telling the Pope about the wonderful opportunity they have of being able to raise their own children, despite their situation. Casa di Leda Director, Dr. Lillo Di Mauro, told the Pope, "Your Holiness, dear Father, we are the invisible ones." He then described the effort it took in setting up the structure. There was an awareness of the importance of transforming a space that had contributed to criminal activity, in order to give back to society a project fostering civilization and humanity. The Holy Father also left gifts for the mothers, including a parchment signed in memory of his visit. His visit lasted about an hour, after which he returned to Santa Marta, in the Vatican. Located in Rome's EUR district, and hidden in a beautiful, green residential area, “Casa di Leda” was formerly owned by persons connected to organized crime. Seized by the State, it has been transformed into a haven for women in difficulty.